The yellow watchman goby is certainly one of the crowd favorites when it comes to small fish that just ooze personality, and they’re getting a whole lot more appealing since their offering is increasingly shifting toward aquacultured individuals. Helping that effort along is a growing face in captive breeding, Sustainable Aquatics, who just recently announced that they will be offering up tank bred yellow watchman gobies to their retail customers, who will obviously pass them on to hobbyists seeking the more responsible choice. There’s nothing spectacular about these gobies. They stay small, hang out in the sand, are not rare even the slightest bit, and sometimes hide in the rocks. 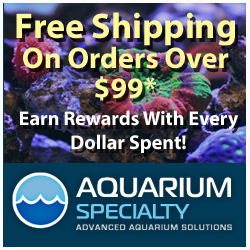 Still, they are in high demand and are very popular among a broad spectrum of aquarium keepers. Because of this, demand for captive bred individuals has also been high, and companies like Sustainable Aquatics can crank out tons of these gobies with relative ease to help meet that demand. Fortunately for fish breeders, the yellow watchman breed well in captivity and hobbyists have had success raising YWG offspring for many years. We’re not sure what the retail price for a captive bred yellow watchman goby will be, but we don’t expect it to be too far north of $20 per individual.